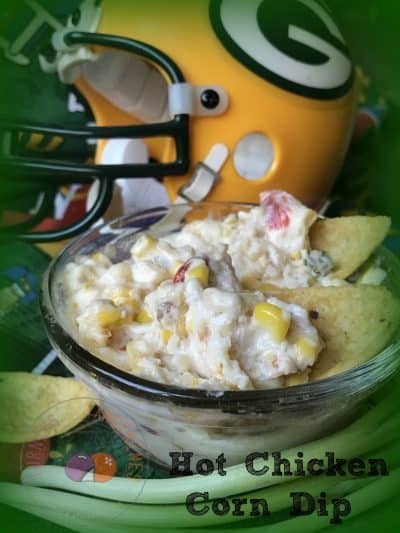 Back by popular demand, Football Friday/Game Day Recipes is back by popular demand for another football season. We received several emails this past week inquiring why we didn’t post a ‘football’ recipe last week. This year, I had decided not to do the Football Friday/Game Day Recipe recipes because after 6 years of doing so, I thought it had run out of gas, so to speak, but evidently I was wrong! And that’s fine with me, I’ve always enjoyed doing football recipes and I’m glad to hear that you do too. 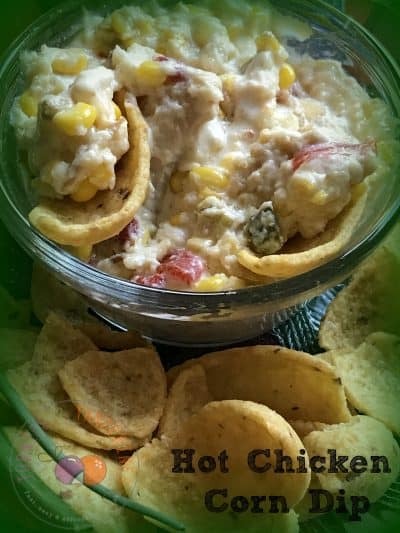 Hot Chicken Corn Dip is super, duper good! 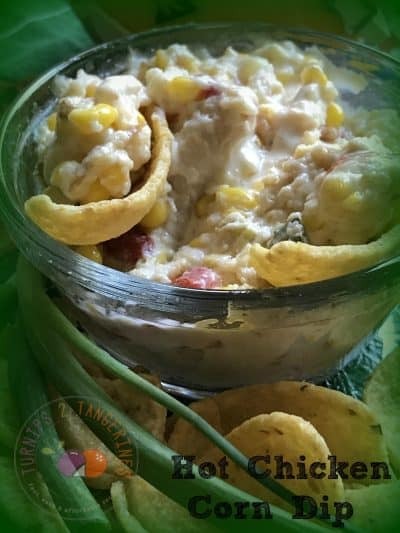 Today we are going to kick off Sunday Snack n’ Pack, with a hot dip that is loaded with canned chicken, lots of cheese, and fresh sweet corn. 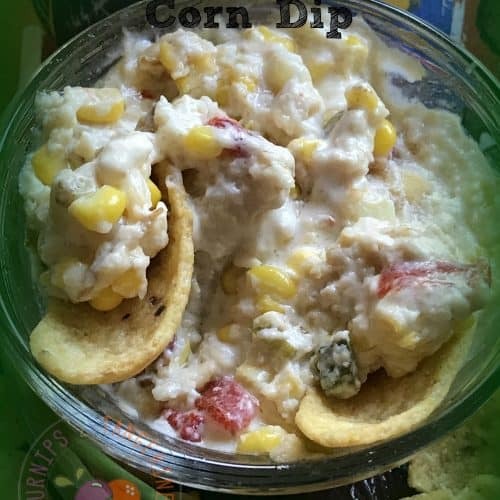 This dip is similar to our recipe for Green and Gold Corn Dip but without the added kick from hot peppers. 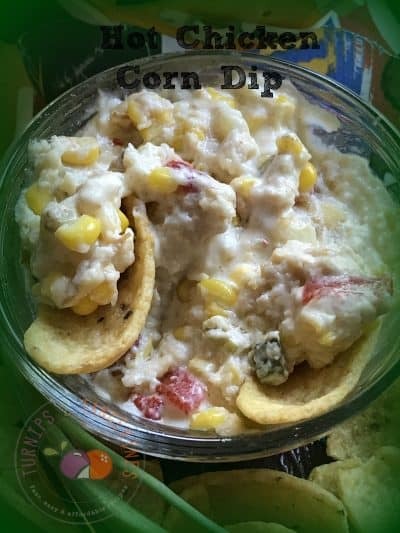 Serve this yummy dip with frito scoops, so you can scoop up all that ooey, gooey cheese, chunks of chicken and corn. Don’t like canned chicken, no big deal, use rotisserie chicken or use extra chicken from last nights dinner. The new name for Football Friday or Game Day Recipes has been changed this year to ‘Sunday Snack n’ Pack’, courteous of my hubby. He came up with the name and I thought heck, that’ll work just fine. The snack recipes on the other hand, will be on the same level as the recipes we’ve posted in past years. 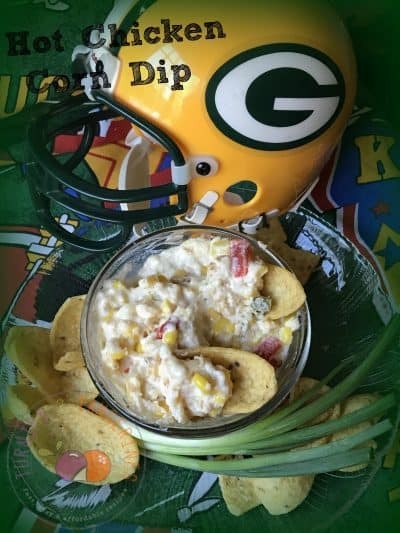 Recipes that are game day friendly meaning, easy to eat while standing, sitting or cheering and easy to prepare. After all, who wants to be in the kitchen all day making some fancy, dancy hors d’ oeuvres you can’t even pronounce. This delicious dip is made with a fantastic ‘smoked’ Swiss cheese. Yes, you read that right, ‘smoked.’ Last weekend, when we had one of those cool, Autumn days here in Wisconsin, my hubby and I took one of our much loved country drives. We love to drive through the countryside and discover new places. Boy did we discover a real winner! We stopped at Belle Plaine Cheese Store/Factory located just outside of Clintonville WI or Shawano WI, depending on which way your coming or going. While there, one of the customers in the store was picking up a large quantity of cheese. My hubby, being his usual ‘Mr Friendly’ self, asked the lady, “What in the world are you going to do with all that cheese?” by this time I had quietly moved away…not because I’m not friendly but I didn’t want to ‘steal’ his thunder…and she replied that her restaurant, Timeline Saloon and BBQ uses cheese from Belle Plaine, had we ever heard of the restaurant. Heck yes! The family just ate there for our son’s birthday and as always, it was super fantastic.In fact, we’re all planning our next dinner date there. While at Belle Plaine we picked up a block of smoke Gouda cheese, smoked Swiss cheese and some fresh cheese curds. Much to our surprise and delight, Belle Plaine cheese store/factory had a rather large selection of cheeses. Both types of cheese we brought we fresh and delicious. The staff was helpful and friendly. We can’t wait to go back and try more of the cheese at Belle Plaine Cheese Store and Factory. 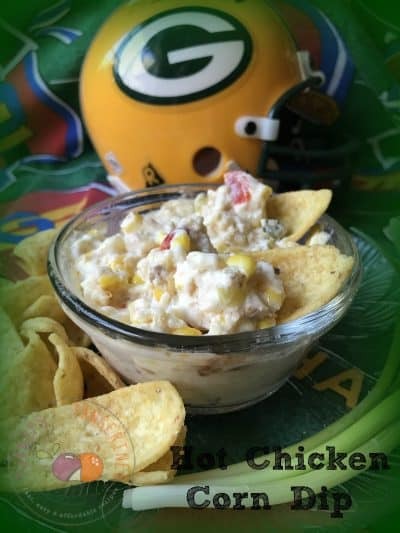 This recipe can easily be doubled or even tripled to accommodate your NFL Themed Crock Pot ..and you do have one, don’t you? Well, if you don’t have one yet, remember that Christmas is right around the corner so you still have plenty of time to add it to your ‘list’. 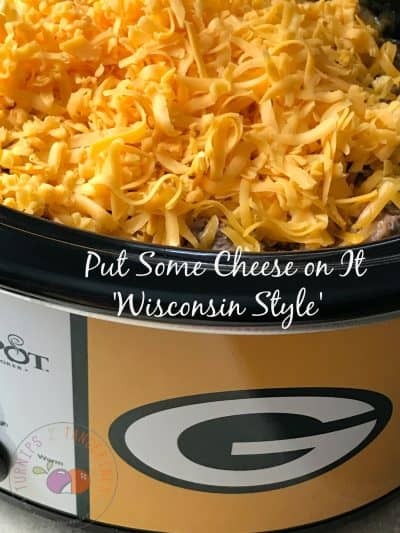 If you want one asap, like I did, head to your nearest Walmart and buy yourself one:) I picked up a Wisconsin Badger themed crock-pot as well. Can never have enough crock-pots, I always say! The perfect, cheesy dip to make during corn season. Cream together cream cheese and miracle whip in medium bowl. Add smoked Swiss cheese and Parmesan cheese. Mix well. Lightly mix in green onions, chicken, roasted red peppers and corn. Lightly spray an ovenproof baking dish with non-stick cooking spray. Spoon chicken mixture into baking dish. Bake for 30-35 minutes or until dip is hot and bubbly. Serve with corn chips. Garnish with sliced green onions, optional. If you get a chance to stop by Timeline Saloon and BBQ please do! You will not be disappointed. The food was beyond delicious, reasonably priced and friendly service. The cheesecake was fantastic too!